I can't remember the day I started asking Mayenne to call me Mommie, but she will simply either look or walk away. I can't help but feel jealous that she always volunteer to call "Pa!" when she sees Chester. Sometime last week, she mastered "Yeh Yeh", ie Ches' dad. Still no "Mommie". I continued to stick my face in hers and ask her to address me at every opportunity I had. Today, at my mum's, she finally managed a "Mama" (and quite clearly it wasn't "Mam Mam" as in for food). Woohoo!!!! I'm sure "Mommie" will not be too far away. 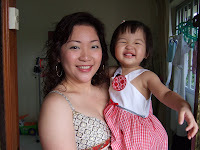 For those who have been following my blog, you would have read about my concerns on Mayenne's linguistic skills, which seemed somewhat delayed as she couldn't really say many words at 20 months. I am very sure she knows how to pronounce the words, but she just simply refuse to articulate them. But our persistence paid off. One day she was watching Dany & Daddy (one of her favourite cartoons). The short clip shows one item and asks the Daddy in the show to pick the correct item from a list of 3 other that has some correlation with the 1st picture. The first picture was a chicken, and when the picture of the egg came, she quietly said "Eeeg! "My mum asked her to repeat, she refused. After hearing my mum's narration of what happened, I picked up a card showing a picture of an egg, and she exclaimed 'Eeeg!' A few days later at a breakfast, I gave her some eggs, and she volunteered "Eeeg!" again. There you have it: Egg - her second word which we can get a respond via a question. The first was 'nennen' (milk). I am hopeful that more will come real soon. A year ago, Little Mayenne at 8 months was clueless about the excitement, loud noises and colourful deco. 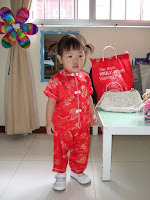 A year later, a little Bigger Mayenne at 20 months can appreciate CNY a lot more. Here are some pictures to show her enthusiasm. 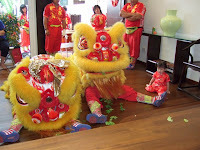 She wants to Lo Hei too.